Ok I would like your opinions on next years trail rides. How many would you like to see next year and would you like them to be 1 day or 2. Please let me know what dates in what months are out for you or a weekend you would really like to go. Go with whatever works for others. 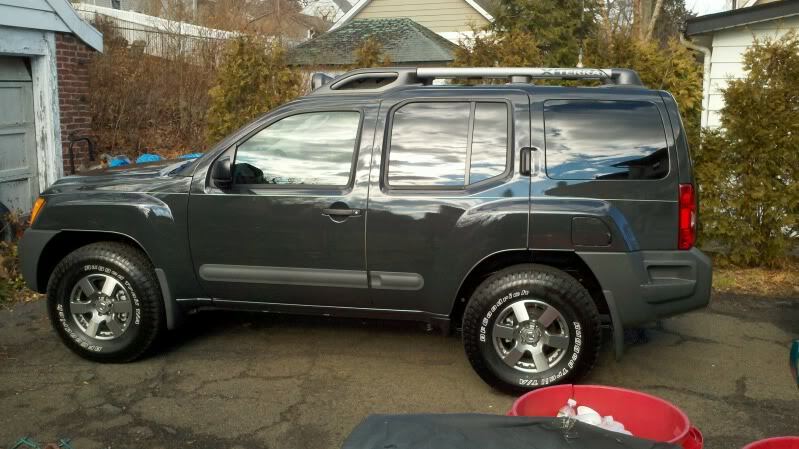 Although I have a brand new Xterra now, I probably won't be wheeling it for a year (until after it gets beat up by shopping carts at the supermarkets, and I get aftermarket armor on it). Wow, traded in the old one Kenn? We nned pictures Kenn in another forum. bullfrog wrote: Wow, traded in the old one Kenn? We nned pictures Kenn in another forum. Not traded. The old one got totaled when a lady ran a stop sign right in front of me. I was doing about 40 mph (the speed limit) when this lady in a honda minivan or crossover pulled right in front of me. By the time I realized she was coming through, there was nothing I could do. The trail bumper was heading right for her passenger door, and I could not see whether there was a passenger there. I tried to swerve to the left (towards her rear), and hit the side if her vehicle just in front of the B pillar. Spun her a bit as she continued through the intersection and on to a lawn. It blew her side airbag and punched a hole in her door. Fortunately, there was not a passenger. She was ok. I was ok (my airbag did not go off). Unfortunately for my truck, because I was swerving to the left and not hitting straight on, the impact bent the front of the frame (including the portions where the pitman arm and idler arm are anchored). The cost for the frame repair, along with the body repair, put it over the value of the truck. 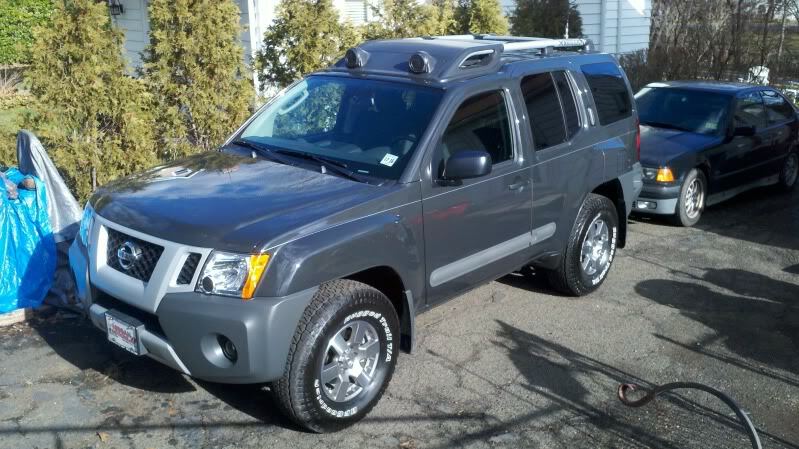 It is the Pro-4X model of the Xterra. It comes with an upgraded Dana 44 variant in the rear with and electronic locker, longer travel Bilstein shocks, an upgrade on the tires (from the BFG long trail to the rugged trail -- better but still not like the BFG AT/KO), and what the call "skids." As always, I got a stick shift. I comes with a bunch of nice farkles, too -- upgraded sound system, bluetooth, roof lights, etc. Looks good! now for the arb for the front a lift kit and RC here you come. You are always welcome to ride along on a ride. my Ram Charger still has the comfy stock bucket seats. Unfortunately, it will be a while before I get the new truck built up enough that I am comfortable taking it off-road -- will need sliders, full aftermarket skids, trail bumper (and maybe a 2-3" suspension lift). It will be a while before I can afford to put all that in. Also, "ground control" does not want to wheel a brand new truck -- so I may have to wait until its dinged up a bit at the supermarket parking lot before I can ding it up more in the woods. you should get a Jeep to beat up and a trailer to haul it on. The X could tow it right? bullfrog wrote: you should get a Jeep to beat up and a trailer to haul it on. The X could tow it right? I thought of that, but not really. The towing capacity of X (with manual) is pretty low, about 3,500 lbs. Towing a jeep on a trailer would probably be over the limit. If you are interested, a group from the Alpha Omega offroad club is doing a trip to Centralia on Sunday, Feb 26. It will be mostly to check out the town, but there may some play on fire trails around Shamokin in the afternoon. Let me know if you are interested in coming out for that one. I will let you know. Can you get me more details? I don't get on the web much anymore do to work and busy at home. I will have off weekends starting March 4th. So if any of you want to go wheeling let me know. First I need to fix my junk though. Dates to be posted soon. Please keep posted. I'm still waiting on Brians schedule. When I get it I will post dates to wheel.